I have an Australian Rainbowfish that I thought would've died a long time ago because of the multiple health problems it has over the past year. I originally asked for your advice back on January 9th of the year about open body sores this fish got after having gotten Popeye twice. eyes. They are both swollen, covered with nasty white patches that are really thick and lumpy. On one eye, the white of the eye looks brown (like dried blood) in certain areas. The fish is definitely blind. He runs into everything, he hasn't eaten in probably 2+ weeks, so I'm not sure how he's even alive. I've checked our water quality and our levels always come back on par. All of our other fish our completely healthy. I don't know what to door for this poor guy. I feel like he's going to die soon, but this seems to be the fish that is incapable of death. "Fungus Cure" and then we tried API Pharmaceuticals' "Triple Sulfa" and then we tried just leaving it alone. The fish has gotten really bad and it looked like it had clear bubbles on it, so tonight I moved it to a hospital tank with Tetra's "Fungus Guard," thinking that the patches on the eyes are fungus, and maybe the bubbles on the scales had to do with a fungus, too. Although, the more I looked at the fish in the hospital tank, I think he may have come down with a secondary Ick infestation. Needless to say, this fish is not doing well at all. I hate that this poor fish is suffering like this. I truly think this fish may just be genetically predisposed to these health problems because it's not the water or the tank. Hello, I am looking for information on what this black/grey color might be on my Melanotaenia Praecox. The "dust" has no visible depth to it at all. Just a different coloration. We have 11 Melanotaenia Praecox. 6 males and 5 females. All around 2-3 inches (5.1-7.6cm) in size. Got them in late December and they looked great up until last week. The one in the picture is the worst off, but all of them are less bright than they should be. The males no longer flash their breeding stripe on their foreheads much at all. They all still have an excellent appetite. Tank is at 78-79F (25.5-26.1C), 7ph, no ammonia, no nitrite, 10ppm nitrate. Floating plants and underwater ferns. Several years ago we had another small school of these fish. They got this "dust" on them one by one. A week or 2 later they would start to bloat and get a white belly. A week or 2 after that they would die. As the worst off would die, the next worst off would be beginning the bloating stage. We never did figure out what to do to fix this. I don't think it's columnaris or velvet. There's no visible depth to the dust. Nor is it gold in any way. You mean like when they are washed out due to stress? But this *is* an overlay on top of the fishes scales. If it progresses like it did 2 years ago, they will get darker and darker until about half the fish is covered and then the bloating starts. The water is 75 gallons of Reverse Osmosis. (The one gallon jugs fit nicely in the microwave to push the temp up to an instant 78F.) We have 5 teaspoons of API brand Aquarium Salt (made from evaporated sea water) in the 75 gallon tank. Not much, just enough for a small buffer without bothering the plants too much. 2 years ago we treated the RO water with Electro Right and Kent PH stable. No known paint vapors, copper salts, etc. Short of a bad batch of gravel or drift wood, there are no known toxins to account for this. Also the tank, decorations and gravel with this tank are different from the tank the last batch was in 2 years ago. All other symptoms are, so far, identical. If there is someone you might recommend me to, I would be glad to give up the school of fish to some University, etc. For dissection or whatever. We never figured it out last time, and so far it looks like it will progress the way it did 2 years ago. That was the last time we tried a batch of these fish. All 11 fish are still alive right now. I should have about 2 to 3 months before the final fish dies. We have a 55 gallon tank with: 2 turquoise Rainbowfish, 2 zebra Danios, 2 emerald Cory cats, 2 praecox Rainbowfish, 1 Australian Rainbowfish, 1 Plecostomus, and 1 striped Raphael catfish. 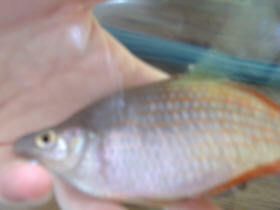 Recently we've had a problem with our Rainbowfish having open body sores and subsequently getting Popeye twice. This has gone on for probably 4 months now and we've done treatments with: Lifeguard, Melafix, Tetracycline, and EM Erythromycin. 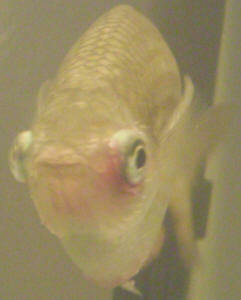 Our last attempt at treatment was done by setting up a hospital tank and dosing only this fish with the Erythromycin. After several courses of treatment we had quite a bit of improvement, but the sores were still present. We placed the Australian back in the 55 gallon tank with the others about 6 weeks ago. Now the sores are looking worse and the Popeye is back again. I also noticed that one of the praecox rainbows has a huge gash in it's side. I checked the water levels and they're all fine. but it doesn't seem to be doing much. Today I noticed that the praecox seems to be struggling and staying at the surface of the water, so I put both it and the Australian in the 10 gallon hospital tank, added aquarium salt, and started treatment with the Erythromycin and aeration with an air stone. Do you have any suggestions on what else I can do? I'm also wondering if you have any opinion on whether the Raphael cat may have caused the injuries to these fish with his hard and spiny exterior? 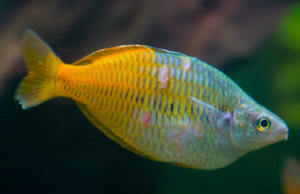 please find pictures of the Australian Rainbowfish that has Popeye and body sores as well as a picture of the praecox Rainbowfish that has the gash on its side. Please also note that where I said, "Recently we've had a problem with our Rainbowfish having open body sores and subsequently getting Popeye," I was referring to only the 1 Australian Rainbowfish that I've attached the pictures of. The pictures should be attached this time. Also attached are photos of the water chemistry as of this morning in the 55 gallon tank (which I replaced the carbon in yesterday after transferring the sick fish into the hospital tank). It seems the levels are off now. The temperature hangs around 76.6F. It may be of worth to mention that the reason we don't have several of each social fish is because we've had some problems in the past with a malfunctioning heater. which has killed off probably 10-15 of our fish. The last time this happened was during the time that the Australian was treating in the hospital tank, so I don't think it's related to the condition. As far as the praecox with the gash in the side, it died overnight. Should I continue to treat the Australian in the hospital tank with erythromycin until I figure out what is wrong in the 55 gallon tank? Thanks for link as far as where to look for information, however, there are a lot of links and stories and I'm not sure what exactly it is that I'm looking for instruction on. <Hello Heather. Platydoras-type catfish are generally extremely hardy, and the last fish to show signs of stress. So if your specimen is currently sick -- and I better make the point here they're social animals that don't thrive kept singly -- it's a good idea to review the reasons why. As Bob mentioned, a broken heater serves no purpose. When shopping for a new one, choose one that either has a clip-on heater guard, or else pick up a heater guard that can be fixed over whatever heater you buy. These catfish are notorious for burning themselves as they nestle against the heater. They like to hide, and switched off, a heater is mistaken for a plant root or something. By the time they feel the heat when the thing switches on, their skin is burned. Catfish don't have scales -- their armour is actually just thickened skin -- so unlike most other fish that can slough off damaged scales easily, catfish can be severely harmed by otherwise superficial burns and cuts. Optimal water conditions should ensure spontaneous healing of such wounds, but any trace of ammonia or nitrite, as well as excessive heat or cold, will stress the fish sufficiently to allow secondary infections. In any event, if you're getting a variety of sick/dead fish, it's a very good sign the aquarium environment is poor. Review tank size, filtration, diet, etc. and act accordingly. To recap, a community of talking catfish and Rainbowfish would need to be upwards of 180 litres in size and equipped with a robust filter rated at not less than 4 times the capacity of the tank in turnover per hour (e.g., a 200 litre tank would need a 4 x 200 = 800 litre/hour filter). Water chemistry should be neutral (pH 6.5-7.5) and the water slightly soft to moderately hard (8-15 degrees dH). Avoid extremely soft or extremely hard water, and don't add salt. Thanks for the information, Neale. Fortunately, our Raphael catfish is not the one with the sores. It is the Australian rainbow that is having the problems with the wounds that won't heal and the recurring Popeye. <Almost certainly a water quality issue, perhaps aggravated by collisions with solid objects, fighting amongst themselves, or a vitamin-poor diet. To recap my previous discussions, we have a 55 gallon tank with: 2 turquoise Rainbowfish, 2 zebra Danios, 2 emerald Cory cats, 2 praecox Rainbowfish, 1 Australian Rainbowfish, 1 Plecostomus, and 1 striped Raphael catfish. We use an Emperor 400 BioWheel filter (400 gallons per hour) in conjunction with a submersible bio filter. We should be getting a pretty good flow with these. I'm not sure if you saw the photos of the sick fish or the water chemistry, so I have attached copies for your review. As you see, our levels were a little high. In an attempt to solve this problem, I did some gravel vacuuming today and a huge water change. The levels are still the same, though. 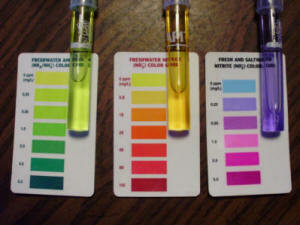 I'm wondering if the fact that our tap water tests high for ammonia has anything to do with it? <Yes, can do. Obviously a filter neutralizes ammonia at a fixed rate, and is designed to remove the ammonia produced by the fish. If you also have ammonia in the water, and this isn't neutralized first, then filter could be overwhelmed. The WHO recommend water for drinking contain less than 0.2 mg/l, and higher levels are often taken to imply a mix of dirty water (i.e., sewage or agricultural run-off) with potable water. If you're getting above 0.2 mg/l, pick up the phone and call your water supplier. I've read online that although the results say it's ammonia (on the tap results), it may just be Chloramine that shows on the test as ammonia. The bottom line is that using one or more products to condition your water (for Chloramine and ammonia) may be necessary, and at least initially, try doing small (10-20% water changes more frequently to avoid flooding the tank with extra ammonia. As an experiment, try skipping a water change one weekend, and see what happens. If you find ammonia and nitrite drop to zero after a couple of days and stay there for the next ten days, then the problem is the TAP WATER. If the ammonia and nitrite levels do not drop to zero, then the problem (in part at least) is THE AQUARIUM. Why? Because even a crummy filter should process the ammonia in your tap water. Once it's gone, it's gone. So if levels don't drop to zero, that means there's some other source of ammonia that keeps topping up the levels in the water. Regardless, I don't think either are probably things I want in our tank. We use AmQuel Plus when doing water changes. Any suggestions on what to do next? I am writing concerning one of my rainbows. I have 55 gal. freshwater aquarium with 15 fish 6 of which are rainbows. My perimeters are Ph-7.0-7.2, Ammon.-0, No2-0 and No3-10, with weekly water changes. <Fine. But what about water hardness? 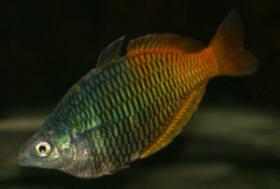 Rainbowfish on the whole come from either soft water habitats or hard water habitats depending on the species. he looks like he doesn't know where he is swimming to because he almost bumps into other fish. Is this cause for concern-something internal---parasite-etc. I would appreciate any info you can give me. I have a 29G long tank. I have two questions but let me give you some background. First, unfortunately, in spite of my best intentions, my two Parkinson rainbows suffered through a week of toxic levels of ammonia and, obviously, the ensuing week of toxic levels of nitrites. The water has been good for about 10 days now. No chemical additives for 3 Â½ weeks now. Ammonia 0, Nitrites 0, Nitrates 30. I have very hard water. GH is steady at 180, KH 120, PH was holding at 7.5, but today has dropped to 6.5 for no explainable reason. When the ammonia spiked I removed what fish I could to my 10G but just could not squeeze these two or my Dwarf Gourami in. I placed the Parkinson's and a Dwarf Gourami in a 5G bucket with an aerator but no heater. It was a bad situation. After about 5 days the rainbows got Ich (no surprise there), the ammonia was still spiked at 6.0 or above regardless of the twice daily partial water changes and so I took a sample to my LFS (not one of those commercial pet stores but a true fish store with knowledgeable people). did another 50% water change, reacclimated the rainbows and Gourami into the tank and ï¿½rode it outï¿½. Since the Ich needs heat to be treated he said to treat if there were still Ich spots 24 hours after they were back in the tank. The one Parkinson did show spots when I first put him back into the tank, but by next morning there were no spots on him or the other two fish. I did not treat for Ich. Since then the Gourami seems to be fine, but the Rainbows started showing signs of red under the side fins behind the gills after about a week. Now about 3 weeks later the one Parkinson in particular is still showing streaking and signs of bleeding, more obvious at some moments, then seeming almost healed at others. The other Parkinson looks healed most of the time but at moments appears very red in the same place as the other. He seems OK. It's the other one showing signs of distress. He has become aggressive and chases everyone into the corners, he swims constantly in the current from the filter (suffocating), and the moments he ï¿½s not doing either of these he actually seems to be trying to mate with my male Dwarf Gourami. Is there any hope he will recover or am I extending his misery? Is there anything I can do to help him? Still no signs of Ich, but disease is sure to follow and I'm afraid to treat my tank for fear of killing off the bacteria that is finally functioning. The other fish have also been moved back into the tank a couple at a time over the past 10 days. 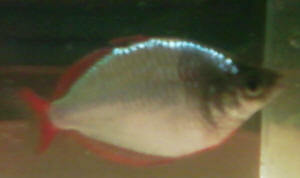 So I now have 1 Dwarf Gourami, 2 Parkinson Rainbows, 1 Boesemanni Rainbow, 3 Congo Tetras, and a pair of Mickey Mollies. At adult size this comes out to 28 inches max. Am I overstocked considering the types of fish I have and the type/size tank? I really appreciate your help. I have searched everywhere and can't find an answer to whether or not he can recover from this stage of poisoning. I will be purchasing a 5G hospital tank setup and heater as soon as I can in the next couple of weeks but really have no resources for that right now. Sorry to bug you but I left out some important info regarding my Parkinson's. Appetites are fine, ravenous actually, and fins are open and often flared. Color remains good except for the red which also runs along the belly line. 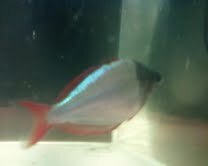 The one that I'm particularly concerned about also has a dark spot behind the fin. It's been there since shortly after he started showing signs of bleeding. I have a mix of plastic and live plants all around the edge of the tank; live sword plant, Aponogeton, java moss, a mixed bunch of leafy plants, a little curly grass thing, and a bunch of water sprite floating on top. One tree trunk decoration and a white lace rock. I'd like to remove these and put in a nice leggy piece of driftwood. Will the driftwood change my water? (other than the tannin which should filter out, right?) I have a 10,000K deep ocean bulb. I've been keeping fish on and off for many years. I currently have a 75Gal mixed reef and a 43Gal FW rainbow setup. The marine tank, while it has had its ups and downs, is doing great at the moment, and until today, the rainbow tank has been doing very well too. The rainbow tank is 2 1/2 months old now, and was cycled using "Cycle" and some Platys (10 little ones to be exact). Once cycled 4 juvenile Boesemanni Rainbows were added ( they were about 1 1/2" when I got them). The tank ran beautifully, without any problems until I found a fish shop that stocked Dwarf Neon Rainbows (which is incidentally what this tank was set up for, but were nowhere to be found!). 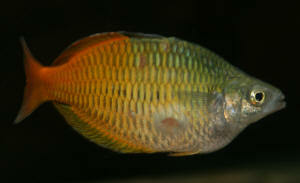 I traded back the Boesemanni Rainbows and Platys, and bought 2 Checkered Rainbows (Splendid I think) and a pair of Praecox Rainbows. Yesterday I bought the remaining Dwarf rainbows (Taking my total to 2 Checkered, and 10 Dwarf Rainbows). Having removed all but two of the original fish (two small sucking cats remained), I figured this was a fair load for the tank, and would not likely upset the filter. The tank param.s are PH 7.0 (which I dropped to 6.8 this evening), Ammonia = 0, Nitrite = 0, and Nitrate unmeasured. I do a 50% water change weekly, as I read that Rainbows enjoy and benefit from this. Water temp is at a steady 26.5C. Today I came home, and discovered that one of the male dwarf's was swimming listlessly at the surface with a opaque white "film" over the top of his head and eye's (but not gasping). I've added a pic in the hope that it might help (thought the quality is not great). None of these fish were quarantined as they were all going into the same tank together, but I have now setup a small spare tank with some water from the main tank, a small heater, and an air stone for the sick male. I expect he will not survive, as I have seen this before, and the outcome was not good. On my first attempt at keeping rainbows (in a different tank, with different decor and plants), I experienced the same problem. At the time Bob was kind enough to offer some advice, but could not identify the fault as anything but "new tank syndrome". On that Occasion, I lost all 8 Bow's over the space of about a week. The fact this this tank has been well cycled, and had Rainbows in it up until the very same day (and doing very well) the new bows went in confuses me somewhat. As I mentioned earlier, today I lowered the tank PH from 7.0 to 6.8 as this is what the PH at the store was, but I didn't think this was enough of a PH difference to effect the fish so dramatically. I'm hoping that you might be able to offer some help, as I have invested quite a bit of money and time getting this tank setup, and finally added the fish that I truly wanted, only to find that something has gone wrong. I have noticed that all the Dwarf Bow's seem to have a tiny white patch on the very front of their top lip, as if the skin has been worn down from rubbing up against something. I noticed this in the first set of Boesemanni that I introduced to the tank, but it soon cleared up. Once again, I hope you might be able to help, as I really don't want to see these beautiful little guy's suffer the same fate as my first rainbow attempt some months ago. Just an additional update. After replying to your first email, I have now noticed another Male with the same symptoms as the first. Not as bad at this stage but I fear he will not survive the day. *Source water is dechlorinated tap water, PH is about 8.0 (reduced to 7.0 using PH down). *Copper Level untested - is this likely to be a big problem? If so I will need to get myself a test kit. I like to think I know a bit about fish keeping, but will also be the first to admit when I need help, and this is one of those occasions! Thanks again Mike, your assistance is greatly appreciated. Would you mind having a look? It sounds like Costia or a similar protozoan. There should still be a picture in the emails with images folder. Thanks again for your speedy reply. During the day, and before I was able to read your email, I popped into a fish shop while out and about on a service call and discussed the issues I and my little friends were having with the store manager. He came to the same conclusion that you have, and narrowed it down to a likely fungal/bacterial infection, as per the your hyperlink for suggested reading (thanks again, it was most helpful). The fish shop manager suggested triple Sulfa, as a good place to start, so I purchased the product and administered it. Going by your suggestion of Malachite Green or Formalin, I assume you considered this to be a Columnaris Fungal infection, which after reading more about its symptoms, looks to be exactly what my rainbows were suffering from. I was also pleased because your website along with the Malachite Green and Formalin, also suggested Sulfa based meds. I imagine that the stress of shipping added to the small worn patches on their top lips was enough to allow the infection to take hold. I am pleases to say that none of the other fish appear to exhibit any symptoms any longer, although some of them did yesterday! I can only assume that the Tri Sulfa is doing some good work. It may also be worth noting, that a small patch of white "fluff" (fungus) was growing on one of my pieces of driftwood. This was never present in the past (in this tank anyway) and has since disappeared. I do recall my first bad experience with Rainbows yielded the same catastrophic outcome, and at the time, the mysterious white fluff was also present in that tank on a piece of driftwood. By this time I'm sure your wondering if I quarantined and treated the fish...... well due to timing, and work commitments, I was unable to set up a big enough QT for these guys so I medicated the main tank. I understand that this will kill of some if not most of the good bacteria in the filter, but at the time it was a race against the clock to medicate these guys, and it proved to be the only option while I continued the rest of my work day (after dropping the Sulfa home to my wife). So frequent testing, and water changes will be required here. Your assistance is most appreciated, and I hope to never have to seek your advice again.... at least for the fishes sake! Having said that, it is wonderful to have such a learned group of people offer assistance to others for no more than a "thank you"... I just wish I could offer more. was pleasantly surprised by 4 baby platies that must have been born just prior to me returning their parents! They are such cute little fellows, that I just may keep them..... although I know that 4 platies won't stay 4 platies for long!! Thanks again for your support, and all the best for the future. <My pleasure, glad that everything worked out!. I am in need of some guidance. We have recently upgraded our tank to a 20gal. We moved the plants and snails to the new tank. After a while, we decided to get some Pseudomugil Furcatus. We brought home 6 of them. All was well for the first 36 hours or so. After about 36 hours I found fuzz on one of the males - not Ick, one big infection spot. The fish was still active and eating at that point so I moved him to a treatment tank and treated with what I had around (Furan - supposed to treat mouth fungus, cotton wool and infections so I thought it would work). I found him dead the next day. I examined the body and saw a big red zone, an injury under the fuzz, so I think he died as a result of a mechanical injury, either in transit or at the store (they're too small and fast to do a thorough exam at the store). The day I found the injured male dead, I also found a dead female in the main tank, this one with no visible sign of illness or injury. Now I am left with only four fish. I think they would be much happier in a bigger group. I'm also worried because I have a trio and a solo, and, although the lone female comes out for food, I have a feeling she'd be more happy if the dominant fish had more fish to chase away. It has barely been a week and, while the other 4 fish seem happy, I'm worried they'll die suddenly like my female. Now, this is my dilemma. This LFS where we bought or fish is the best close to us, they're the only serious, specialized fish store around, but we haven't been happy with the fish we've bought there so far. There is a pet store that has healthy-looking, vigorous fish, but their selection is limited, and they don't have any Furcatus. There is also a very new fish store a little further away who insists heavily on the virtues of wild-caught fish - I'm weary of them because the seller told me I was crazy to have a heater for my Betta (another tank), and was rambling on some nonsense about UV sterilization. I know this doesn't mean they have bad stock, but I don't know if I can trust their husbandry. I also don't know if they have Furcatus in stock. So, do I wait a few weeks before I get new fish until I'm certain enough my current 4 are going to make it? But if I do that, should I worry about my lone female? If I do get more fish should I go back to our usual LFS and risk buying another half-dozen, and hope those make it? My other choice is mixing the Furcatus with long-fin rainbows (those are easy to find) - would they even interact, given they're not the same species? I'm including the previous correspondence below for reference. Well, things didn't work out. I lost another male a day after I wrote you, then yesterday night one of my remaining females pineconed (I euthanized her when she started swirling). I have two Furcatus left. I'm wondering if I should put my misfortunes down to bad stock or bad husbandry. My tank is 20 gal standard, with Fluorite substrate, plants (Bacopa, Anubias, Amazon chain sword, Dwarf Hygrophila), two Coralife T5 bulbs. pH is steady around 7.4-7.5. Temperature was a bit high, hovered around 80 but is now going down with the cooler weather coming in, is now steady around 78 - this is with the heater set on low, if I remove it, it goes down to 70-72. No detectable ammonia, nitrite or nitrate (the algae must use it all). Filtered with two Aqua-Clear Minis (each rated up to 20 gallons), with sponge. One with added ceramic media, the other with carbon (I know what you think of carbon - I'll explain myself later). We were good in the last few weeks and did weekly water changes, about 25% each time. Not much vacuuming because the plants were new and there were only three snails in the tank. We had a problem with BGA these last few months, but with the new substrate, new plants and new lights it's slowing down radically. We still remove it manually. The first thing we tried keeping was Mollies, but they all died of Camallanus over the course of a few months. They were in brackish water too. We now know the tank was too small anyway. The Amano shrimp lasted a long while (several months), and we used to have Cherries also. At some point, they started dying too. The only thing I changed was that I stopped using carbon, so I put it back. No luck. Our new batch of Cherries didn't make it past two weeks either. The Apple snail seemed to fare better, he's been with us for about 6 weeks and seems happy. The Nerites, though, are with us since the beginning and growing at a steady rate. The beginning was when we got our Betta, over a year and a half ago. He's his usual increasingly-grumpy old self, in another filtered, heated tank of his own. Basically, even if we know that Bettas are resilient, I'd be surprised we kept it this long (even neglected it at some point along the way) if our husbandry or water was this bad. And snails are sensitive to contaminants, or so I hear, but they seem to be doing fine. But we seem to be serial shrimp and fish killers. What is our problem? Did we start with bad stock? What would be your absolutely easiest, sturdiest, non-plant-eating, compatible with inverts, non-aggressive, easily available fish for a 20 gal tank? <Many options. Depends what you're after. At the moment in my 10-gallon tanks with shrimps and snails I have peacock gobies, Aspidoras pauciradiatus catfish, bumblebee gobies, and Limia nigrofasciata. Wrestling halfbeaks are also good, being able to adapt to a very wide range of water chemistry values. I doubt we'll have the heart to try Furcatus again any time soon. Advice, please! 05/23/08 Hey Bobster, <Jorie> How are you? Are you still traveling about in Egypt? I can't recall. Heck, I can't even keep my own schedule straight, let alone yours:-0 <Now in Germany> I wanted to "pick your brain" a little with regard to my newest fish drama. Long story short, I've got a 44 gal. planted FW tank, well-established, that's been home to 3 boesemanni rainbows for several years now. No new additions, regular water changes, etc. Temp = 77 degrees F, pH = 7.5. Tank also houses 2 emerald Corys, 4 platies, 2 Botia striata and 1 SAE. All have been with me for quite some time now; newest addition was 2 platies about 4 months ago (they were QT'd for a month!) Since the beginning, I've had issues with recurrent Lymphocystis on the largest of my male boesemanni. As I understand it, this is a virus, thus never truly goes away. At one point (this was several years back), the problems were recurring on a more frequent basis, and I invested in a UV sterilizer. That seemed to help. When we moved 2-ish years ago, I didn't set up the sterilizer again, as the bulb was broken. I do have a replacement for it, but never got around to setting it up again, as the problems seemed to be virtually non-existent. In any case, I got some new food for the boesemanni (3mm Spectrum New Life sinking pellets), thinking they would appreciate something a bit more substantial than their usual 1mm pellet meal. I think the boesemanni at issue ate 2 of the larger pellets stuck together, and injured his mouth. This was approx. 1 week ago. I noticed that he couldn't shut his mouth. I stepped up the water changes, changed the filter media, etc., to prevent any secondary infection. A few days later, the mouth was able to close more, but the Lymphocystis nodules were back in full force (the mouth area was always one of this fish's problem areas...seemed to be very susceptible to the virus). I am starting to worry, as it has been almost a week now. He's interested in food, but seems to be unable to swallow. I haven't used the larger pellets since this issue arose; the 1 mm pellets come right back out, as does the flaked food. I'm afraid the virus could be obstructing his throat, or that he really hurt himself with the large pellet. I can see into his mouth/throat - there doesn't appear to be any visible obstruction. What worries me is that the Bailey and Burgess book talks about this issue, and says it is "very important" to bring the affected fish to the vet for possible surgery. We don't have a "fish vet" in our area...so that doesn't appear to be an option. In fact, I've never encountered a vet that handles fish at all... <There are a few> Unfortunately, I broke our QT tank while cleaning it several months ago. I need to purchase a new one, which I plan to do today. I've got 15 gal. of RO/DI water made up, thank goodness for that. Aside from QTing this rainbow and keeping the water as clean as possible, what can I do? As I understand it, antibiotics will do nothing for Lymphocystis. Do you think there's benefit to treating for secondary infection? Or perhaps MelaFix (I know Chris thinks nothing of it, and I know you and I have talked about using it in conjunction with good husbandry...maybe it works, but maybe it's just the latter...) <I would NOT use the "fix"> Anything else I can/should try? Aquarium salt? In all my reading, it seems as though now the biggest problem is the potential of the fish starving to death. I did see him pooping today, so that's a good sign; I will say it was a small string of feces, though...much smaller than usual. Any advice you can give would be appreciated, as always! Looking forward to seeing you soon! Best, Jorie <You could try a bath (higher concentration) of a Furan compound... but I'd likely leave the fish in and as is... focusing on improving and sustaining the best water quality here. BobF> Jorie K. Johnson, J.D.